The new Malibu Coast AVA might be DOA. Today the Los Angeles County Board of Supervisors passed a far-reaching coastal plan that specifically prohibits planting new vineyards. Existing vineyards with a valid permit are grandfathered in, but there are a few with no permits that may be forced to rip out their vines. L.A. County Supervisor Zev Yaroslavsky said the regulations would ensure that the coastal mountains don’t become suburbanized, like those to the north in Calabasas or Agoura Hills. Yaroslavsky dismissed claims that he targeted the wine community, saying the decision is really about the greater good. Hey, we love pinot noir and we know full well that the grapes have to be grown somewhere. Supervisors that voted for this plan should be prohibited from consuming any wine. “T.D. TTB–121, Establishment of the Malibu Coast Viticultural Area, which establishes the approximately 44,590-acre “Malibu Coast” viticultural area in portions of Los Angeles and Ventura Counties in California. 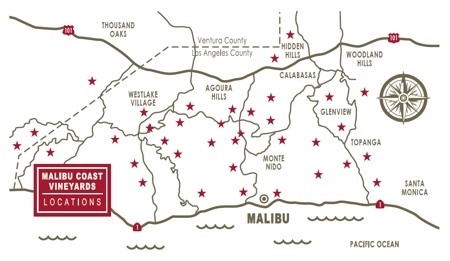 This viticultural area includes the smaller, established Saddle Rock–Malibu and Malibu–Newton Canyon viticultural areas. Who says government can’t act fast? Eight short days later the Supervisors told the wine industry to forget it. KPCC in Pasadena has a 30 minute segment that was aired just as the Supervisors were voting on the plan. I stared at my radio in disbelief when one of the guests informed host Larry Mantle that it had passed. “The passage of the plan, known as a local coastal program, consolidates land use authority with the county and sets rules for future development in the coastal area near Malibu. Among the limits on future development is a ban on new vineyards. Permitted, existing vineyards would be allowed to remain. So much for being guided by science. Most vineyards get all the water they need from winter rains. Even in a drought year like this, Napa and Sonoma wineries are not watering their vineyards. Vitus vinifera needs to struggle to produce high-quality grapes. Although the proposed rule would prevent them from expanding, vineyards with Coastal Commission permits would be grandfathered in. Vintners who didn’t get those permits, however, might have to yank up their vines. That’s the reality facing Dave and Ruth Gomez, who planted grapes on two slopes near their home 15 years ago. And here’s a list of the members of the association. We urge you to buy their wines. (Click the image to make it larger — and readable). Tony Lima has been a California wine fan since arriving in California from the east coast in 1974. He's lived the growth and expansion of the West Coast industry first hand. He's seen the fickle California Wine consumer fads pop up and burst... the craze for Zinfandel, then oaky Chardonnay, then Merlot, now Pinot Noir. On behalf of fellow Californian oenophiles, he hunts for great pinot noir and great values in pinot noir all along the West Coast. His day job is Professor of Economics at California State University located in Hayward. His undergrad degree in chemical engineering (MIT) and his MBA (Harvard) and Ph.D. Economics (Stanford) are the root of his interest in the Business of Wine. He is a card-carrying member of the AAWE - American Association of Wine Economists.